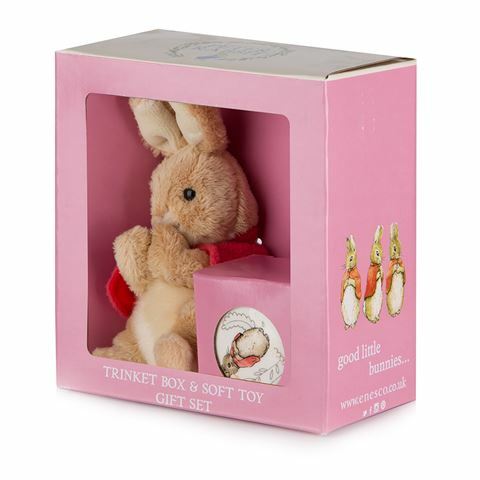 For an unforgettable gift, there’s the Flopsy Bunny Soft Toy & Trinket Box Gift Set from Beatrix Potter. This lovely set features a ceramic trinket box decorated with a Flopsy Bunny illustration as well as an adorable Flopsy Bunny plush. Both items feature a fantastic level of attention to detail and are sure to be loved by fans of the iconic children’s character. Trinket box made from ceramic. Features a traditional Flopsy Bunny illustration. Presented in a Flopsy Bunny gift box. Ceramic Mug – 6cm (d) x 3.5 (h). Plush Toy – 8cm (l) x 12cm (h) x 8cm (w).